There is great satisfaction in being in a show that run’s for a long time. In addition to the financial benefits, it’s gratifying to know that a great number of people can see your work, and that you are engaged with a large audience. A long run though, is ultimately a presentation of product. Certain companies are engaged with their work daily and continue to evaluate the work in a constant process oriented methodology. I admire that. 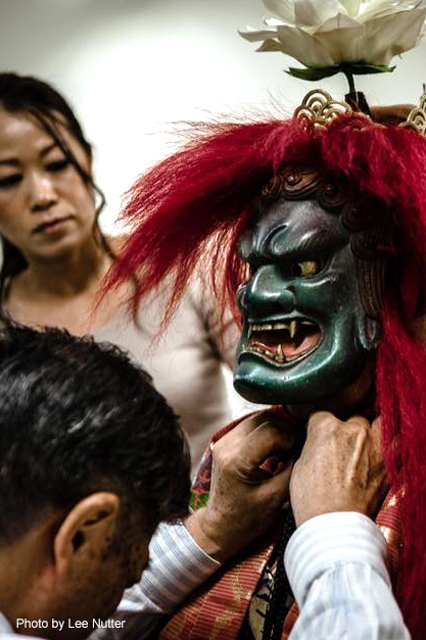 Traditionally noh is a one-off event. “That” group of performers, gathers “that” one time, to perform “that” one piece. Even though it’s from the classical repertory, it’s the first time and only time it will be performed that way. It’s an ephemeral event. 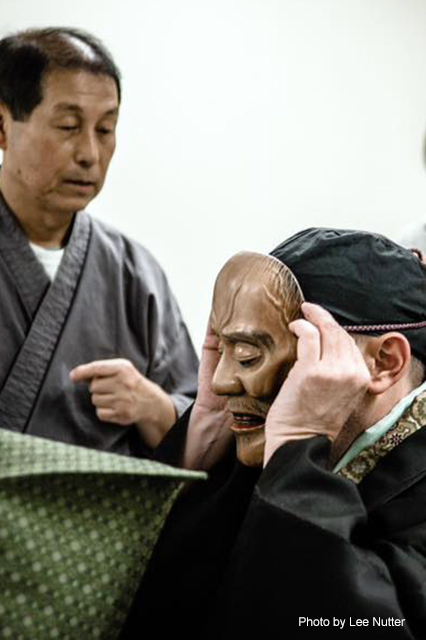 I’ve been truly privileged to be involved in Allan Marett‘s new noh Oppenheimer, which we’ve approached in a very traditional way. As it is a new piece we’ve luxuriated in 5 days of rehearsal, but the majority of the work, was done before we arrived. The intellectual part of the process, the pattern learning, the order, intention, was our individual work. Then under the watchful eye of the project creators, we took some days to let the work seep into our bodies. This kind of work needs to live in you, if you are thinking about what comes next, it’s too late. It’s hard to describe the kind of concentration that’s required. I think ideally, when one dons the mask for the performance, a mild possession would take place where the subconscious guides the performance as the conscious mind engages with the other entities onstage: the waki, the chorus, the musicians. When the occasional magic happens, I can watch the performance from the audience in a bizarre astral projection kind of way. I can see what the audience sees, as if I’m watching with them. It’s being “in the moment,” but not in the way I did my Strasberg training in college. I’m striving to be not simply one with the character, but one with the room, audience, performer, and material. I am so grateful to have one more opportunity to share the space with everyone involved in this project. Thank you Allan for the words, Rick for the score, Hide for the mask, Omura-sensei for your guidance and Matsui-sensei for your confidence in me to rise to the challenge. This entry was posted in English-language noh, Performances and tagged akira matsui, Allan Marett, 頑張り, john oglevee, oppenheimer, richard emmert, strasberg. Bookmark the permalink.